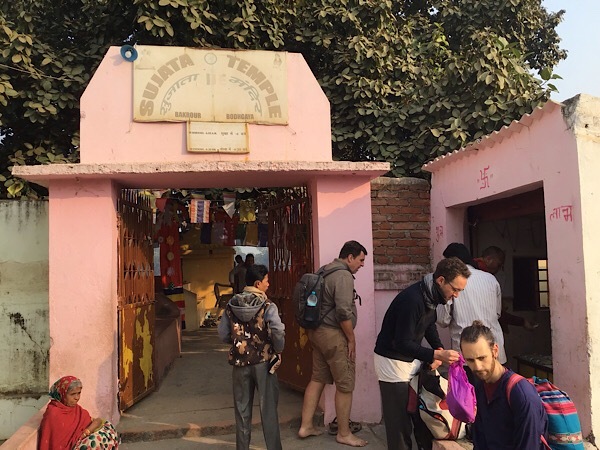 On one morning we left our hotel to walk to the other side of the river near Bodhgaya. There in a place that used to be called Uruvela, in the days of the Buddha, our forest monk called Gotama nearly died. He had taken up asceticism together with 5 companions to such an extent that one could see his spine protrude through the skin of his belly. He was fainting regularly and a little village found him at the bank of the river. Her name was Sujata and she carried ricemilk as an offering to the forest deities. When she saw the monk lying there she took pity on him and poured some of the milk in his mouth. From then on she came back daily to nourish him. And he slowly recollected his powers. This made clear for him that mortification was not the road to the cessation to all suffering. He remembered a situation from his youth. His care takers had left him sitting in the shade of an apple tree. There he had been totally content and at peace. He had remained in deep contemplation until the care takers found him again. He realized that he had to stay away from extreme asceticism as well as indulgence. 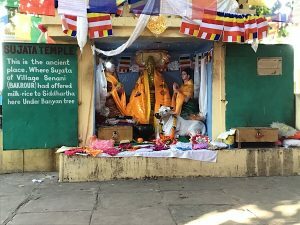 This made him find a peepal tree to sit under, swearing that he would not get up again before the suffering had been dissolved. 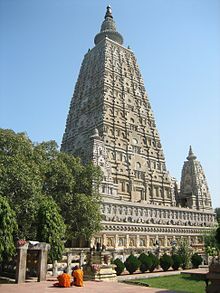 That was of course the Bodhi Tree at Bodhgaya. 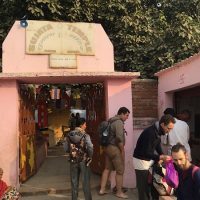 In order to get to the place where Sujata is sought to have nourished the Buddha, we had to walk about 6 kilometers out of the city and over the river, that had dried out by now. 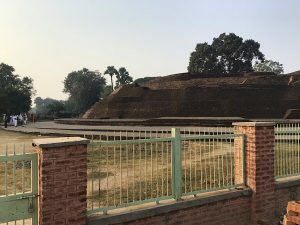 The first thing we encountered was an old big stupa, build in reference to Sujata. 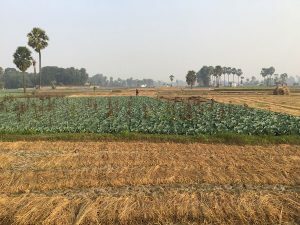 After circumambulating the stupa three times, we continued throught the rice paddy’s and some vegetable patches. Until we finally came to a small shrine in the middle of these fields. It was endearing how the local people were taking care of the shrine and giving us candles and incense to use for our offerings. It was there thatwe sat and chanted our Tibetan prayers. So we can conclude that if Sujata had not passed by and felt compassion for the ghost like appearance of the sravaka, the Buddha would not have come into existence. And that would imply that the way to the abolishing of all suffering would not be known today.